Did you know that you can recreate the awesomeness of a drive-in movie right in your own backyard? It’s true! All you need is the best outdoor projector and a dark night and you’re ready to go. We researched some of the top brands and best sellers to put together our outdoor projector reviews to help you find the best one for you. Before we get started, here are some key features to keep in mind. Lumens: Lumens measure the brightness of the projector. The higher the number, the brighter it is. For some reference, a projector with 2000 lumens would probably be too bright to use indoors. For outdoors, anywhere from 1200 and up works. Resolution:- All of these projectors have a resolution of 1080p. What exactly does that mean? Technically, it means there are 1080 horizontal lines of vertical resolution. What you need to know is 1080p means the image is full HD. Contrast Ratio:- Technically, this is the ratio of the brightness of white to black in the image. What does that mean? The higher the ratio, the more details you can see. These products range from 1000:1 to 4500:1. 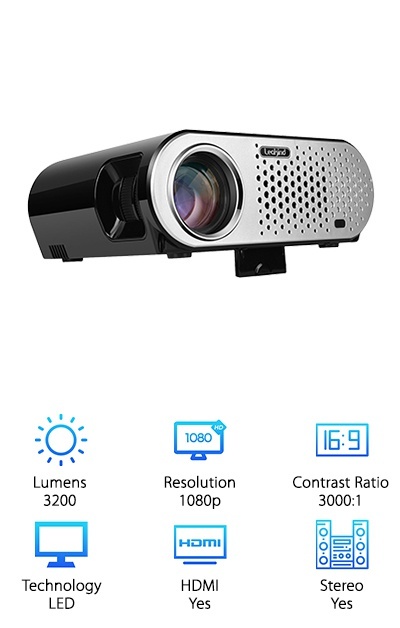 Technology: All of these projectors come with LED technology. Why? Well, there are a few reasons. It provides a bright and reliable image. They’re also very energy efficient plus the light source can last for up to 30,000 hours. HDMI: When it comes to HDMI compatibility, all of our picks have it; that’s how you hook up your laptop, gaming system, or DVD player. Our picks are great but you won’t find the best wireless projector here. Stereo: A few of our picks have built-in stereo speakers so you not only get a great picture, you get great sound. If you need to improve the quality, all of these can be hooked up to auxiliary speakers. 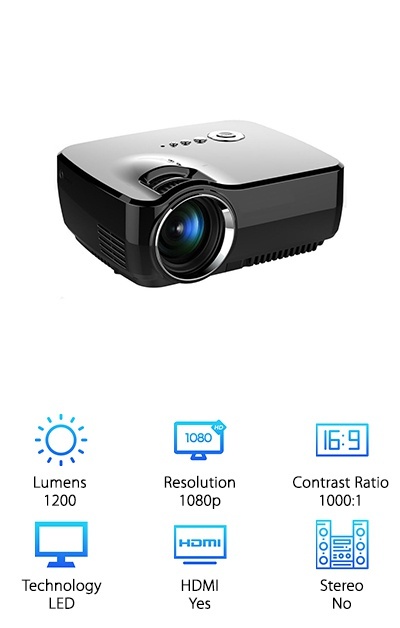 Now that you know a little more about choosing an outdoor projector, we can get right to our reviews. Here’s the deal: we listed our top pick and budget pick first so if you don’t have time, that’s a great place to start to get a taste for what’s out there. Hang around if you can and keep reading to find out more about the picks that round out our list. Are you ready to get started? Great, let’s go! Our top pick for best outdoor projector is this one from CiBest. There’s so much we love about it. 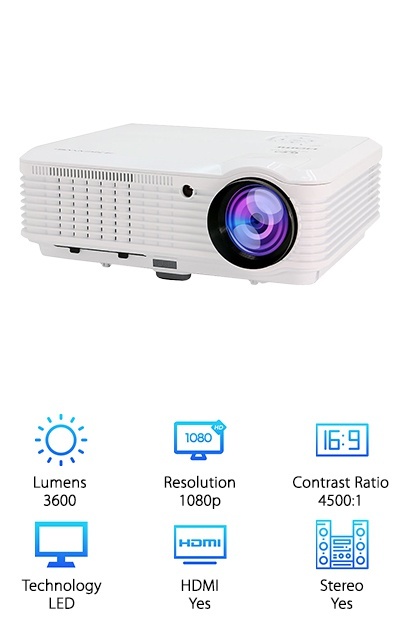 First of all, CiBest Video Projector’s high contrast ratio means an HD picture with vivid colors making it one of the best projectors for outdoor use. Another one of the great things about this projector is the sound. It has a built-in HiFi stereo system with an amplifier chip that really amps it up. If you do want a bigger, louder sound, you can easily attach it to an external sound system, too. You can use this one with a laptop, DVD or BluRay player, gaming system, or any HDMI compatible device. That’s not all, if you have a wireless HDMI adapter or MHL cable, it works with smartphones and tablets, too. Oh, and don’t worry about positioning. The manual Keystone Correction lets you adjust the angle by 15 degrees so you always get a nice, straight picture with minimal fuss. 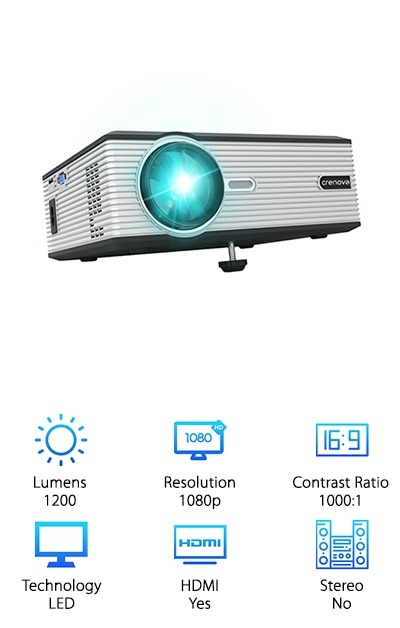 This mini projector from Crenova is our budget pick. It’s small in size but we were really impressed with all the features it has. It’s compact and lightweight so not only is it easy to travel with, it’s also easy to store. The LED in this model has been upgraded and projects a clear, bright picture. This is great for a few reasons. Not only does it look awesome but it’s not as harmful to your eyes as a regular television or computer screen. It’s also more energy efficient. Believe it or not, since the upgrades, this model uses 70% of the energy that similar models use. That’s not all. It’s really easy to adjust the image without affecting the quality. You can even use the keystone button to get a perfect image if the projector isn’t straight. 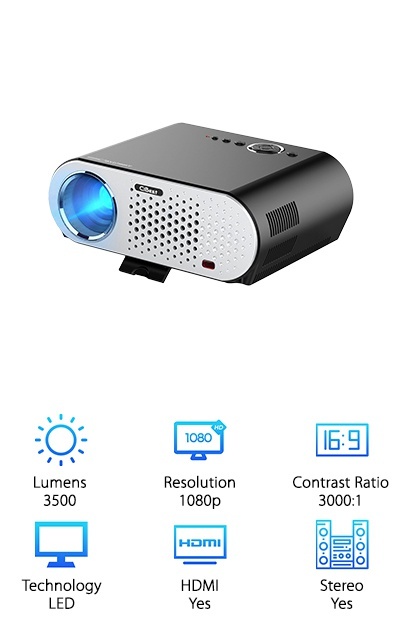 The Meyoung Mini Projector is the perfect size to take with you anywhere. Watch an outdoor movie on a big screen while you’re camping or even just outside in the backyard. This one works with laptops, PCs, Blue-ray and DVD players. Plus, you can plug in an SD card or flash drive. That’s not all. With an additional HDMI adaptor or MHL cable, you can even use your smartphone or tablet to watch movies, videos, or even look at pictures on a slideshow. You can even use it to play video games on a screen that’s adjustable from 50 to 130 inches. You don’t have to use it outside! It’s also great for an indoor entertainment system. It’s also lightweight and compact, too, so it’s easy to store and won’t take up too much room if you take it traveling. One of the great things about this speaker from Ohderii is that it has built in stereo speakers so the sound quality is great. You won’t need to worry about hooking up any additional speakers. This projector has a mounting hole if you did want to use it indoors but where this one really shines is outside at night. 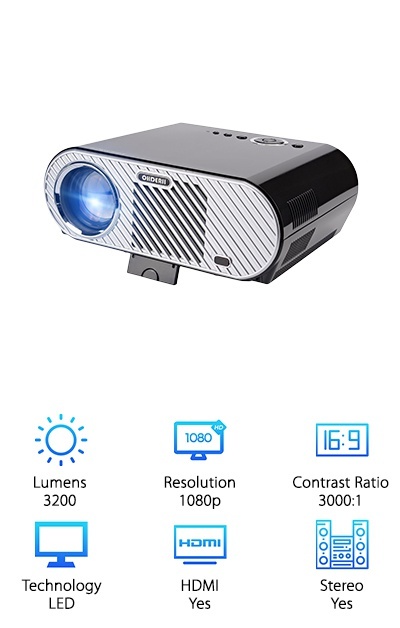 This projector has a higher contrast ratio than we’ve seen yet and you’ll be able to tell the difference. The pictures are brighter, crisper, and just look really great outside under the dark night sky. It’s a true HD picture. Another thing that’s really great about this projector is it’s really easy to position in any direction. Hook it up to your laptop with the included cables or get an additional cable and use your smartphone or tablet, too. For a crisp HD picture with amazing colors, the GooDee Movie Projector is a great choice for awesome outdoor movie nights. It supports just about any playback, including movies, videos, music, and even e-books. Or, hook up your gaming system for a really awesome way to have a game night. Think about it: what better way to play your favorite video games than outside, under the stars, on a 180” projection. And it’s really easy to use! It works with smartphones and tablets, too, with the purchase of an additional HDMI adapter or MHL cable. The built-in speakers are stereo quality, too. Plus, the projector itself is really quiet when it’s running so you won’t have any distractions. The warranty is pretty great, too. If something goes wrong, you can exchange it for a new one for 2 years. 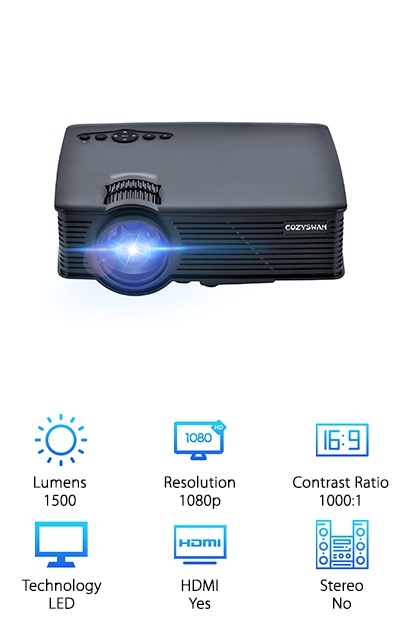 This pick for best outdoor projector is from Cozyswan. 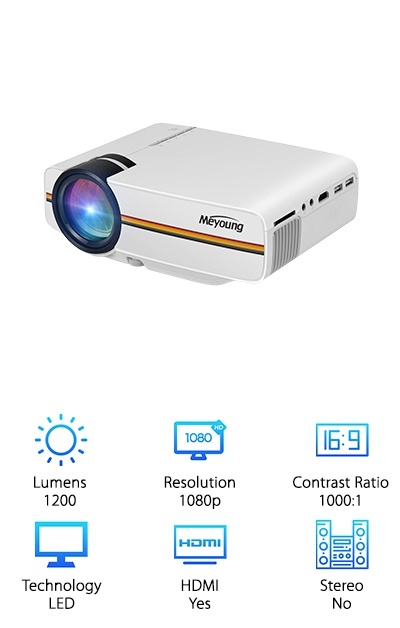 It’s a mini size that still manages to be 50% brighter than other LCD projectors. It’s really lightweight and easy to set up so you can take it wherever you want. Seriously, anywhere: provide entertainment for the neighborhood, take it to a birthday party, use it when you’re camping. One thing that we think you’ll really like is how many devices you can use this with. Your PC, Roku, Amazon Fire Stick, Chromecast, PS3, Xbox and the adapters are included. (You can use it with your smartphone or tablet, but you’ll need to get an HDMI adapter or MHL cable, which are not included.) And here’s the kicker. It comes with a full 3-year warranty. Because this Zenhon mini projector works best in the dark, it’s perfect for outdoor use. You can use this one with just about any device thanks to the range of ports: USB, HDMI, AV, VGA. Plus, it comes with all the cables you need for a laptop, computer, or gaming system. (You can use it with your smartphone and tablet, too, but you will need additional cables.) Watch movies, music videos, or hook up your gaming system for an awesome night outside. 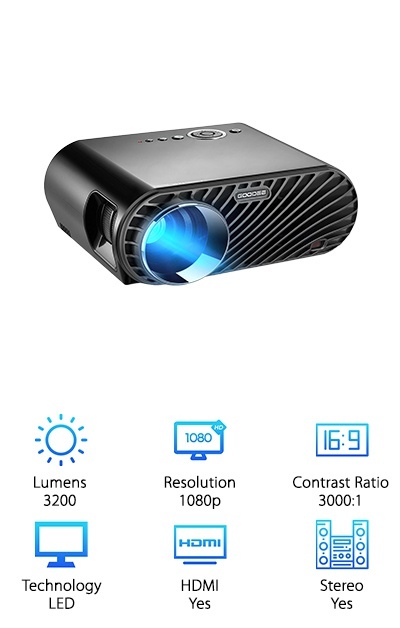 This projector is really light and portable. Plus, it’s easy to use so you don’t have to worry about a difficult or annoying set-up when you take it from place to place. The sound quality of the speakers is good and it’s equipped so you can set up stereo speakers if you need more sound. For the best smartphone projector, give this one from a closer look. Why do we think it’s so good for smartphone? The 4500:1 contrast ratio means you’ll get an exceptional picture, crisp and clear HD with rich, deep colors. This one’s really easy to adjust, too. Get this: it supports ceiling, rear, and front projections and you can even flip the image 360 degrees. You can use the manual keystone correction so adjust the projector vertically to 15 degrees, too. Another great thing is that set up is really easy so you can avoid those annoying installation problems. The LED light will last up to 50,000 hours and is energy efficient. The sound on this one is pretty impressive, too. You don’t need your own speakers thanks to the 2 Hi-Fi speakers that are built right in. 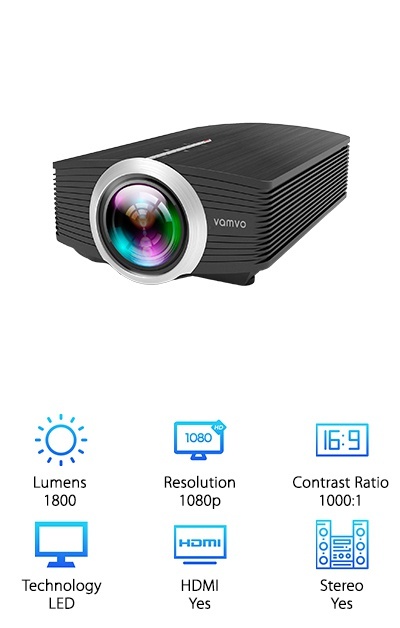 This portable projector from Vamvo has full HD resolution so you’ll get a great picture every time. One thing that we really liked is the built-in stereo speaker. You don’t have to add any additional equipment but if you wanted to amp it up a bit for a party, attaching it to your stereo system is easy to do. You can connect most devices because there are input slots for HDMI, USB, AV, and VGA. Attaching smartphones and tablets is easy, too, with an additional adapter cable. The manual Keystone Correction adjusts the image vertically to 15 degrees. What does that mean for you? Easy, fast, and precise adjustments for a centered image. We also really like that this projector comes with a 12-month warranty. And that’s not all, Vamvo also provides good customer support. This pick for best outdoor theater projector puts out a great HD image and will look great when you set it up after dark. It also has plenty of ports so you can use a lot of different devices. One thing that’s really cool about this one is that it has a double tube cooling system to help keep it cool. That means the fan runs a little quieter than some other models so there’s less chance that it will distract you from the movie dialogue. Plus, this projector has stereo speakers for a great sound without the need for additional equipment. Getting the right angle is easy, too, because it comes with a manual vertical Keystone Correction you can adjust to 15 degrees. One more thing: it comes with a 2-year warranty and professional tech support.